Continuing with fairly short rides, we cycled on Sunday, January 20, from Kingston to Lumsden, 60 kilometers. 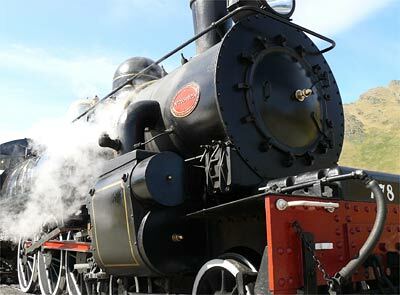 We passed the Kingston Flyer, a beautiful old steam locomotive that is hauling tourists up and down the valley. There were a couple of moderate climbs that became difficult because the day grew warmer and more humid than we've experienced so far. Generally, though, it was easy cycling. The countryside was changing, the chain of mountains receding behind us, and rolling to flat ranch and farm land around us. It was quite beautiful, in its way. At Lumsden, a small village with just a few stores, we found a municipal campground that had the nicest grass and the best equipped kitchen we've come across so far. 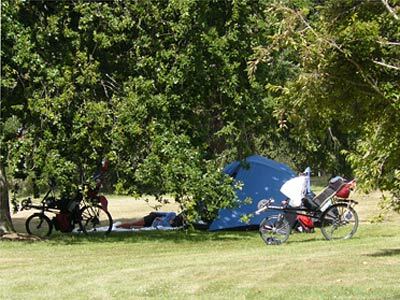 Grassy campsite at Lumsden  and cheap too! 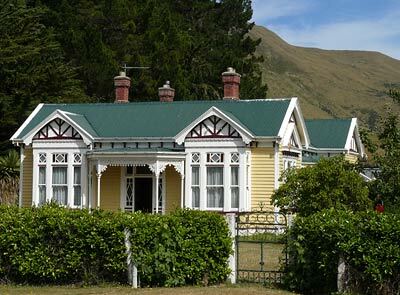 Monday morning we left Lumsden for Te Anau. It was a beautiful, hot, sunny day. We stopped briefly in the roadside village of Mossburn. 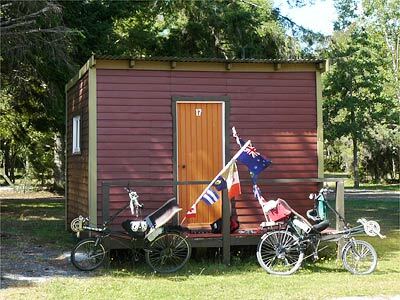 The wind gradually built up, and when we were 15 or 20 kilometres from Te Anau, it was almost in our face. 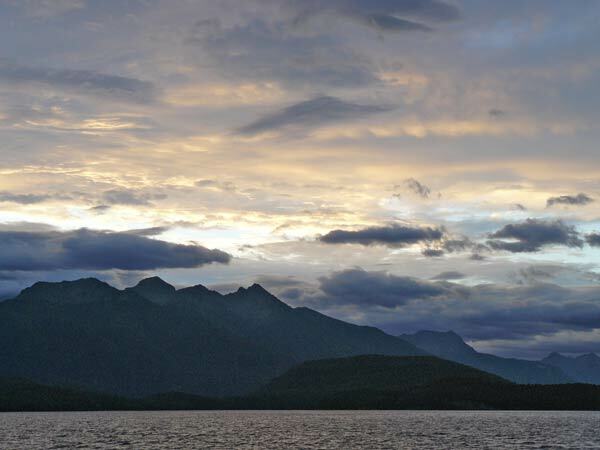 Partly for that reason, we made a last-minute decision to turn south and go directly to Manipouri, from where our Doubtful Sound cruise begins Thursday morning. It was a good decision. 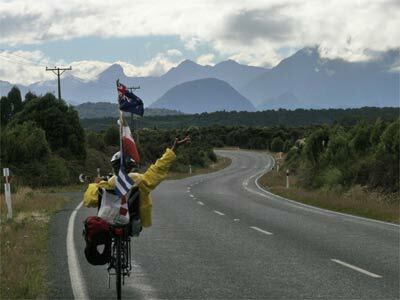 The inland road to Manipouri was really beautiful, and with the wind now more or less behind us, it was an easy ride. Clouds were moving in from the north, and the weather forecast was not good. 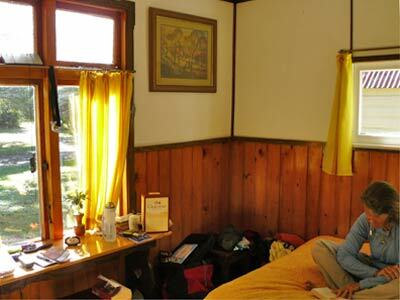 Therefore we decided to rent a tiny cabin for our three nights in Manipouri before the cruise. It was another lucky decision, because it rained all night and well into Tuesday morning. The cabin looks like nothing from the outside, even in the sunshine later on Tuesday. 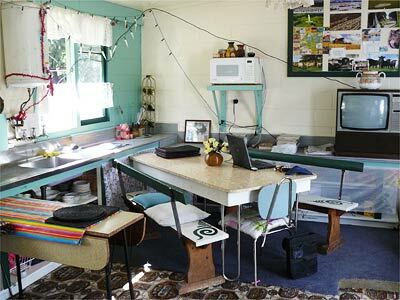 However, inside it is surprisingly airy and pleasant, despite our stuff now strewn all over, with a double bed, single bed, and work table under one of three windows. 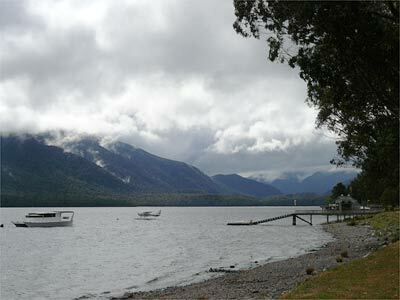 Once the rain let up on Tuesday we decided to go into Te Anau  about 21 kilometres each way  for food shopping and internet services. 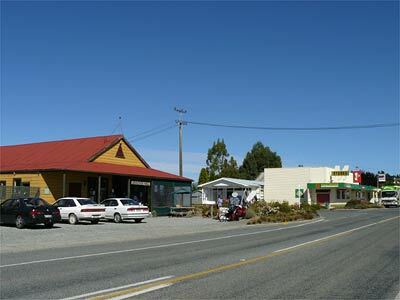 Te Anau, as we expected, was fairly busy and replete with tourist services of all sorts. 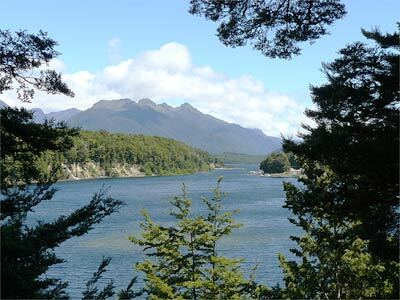 Lake Te Anau was impressive but not as beautiful as Manipouri, we thought. At the supermarket in Te Anau we enjoyed one of those amazing encounters that sometimes happen when we are traveling. A young couple were loading groceries in their huge backpacks while we were loading our bicycle panniers. We chatted only briefly before mentioning that we lived in Vermont. When the young man asked where, and we answered "South Strafford," he said, "I"m a Wilson!" We had just met Eli Wilson, son of the late Jay Wilson and nephew of Sherm and Bob! 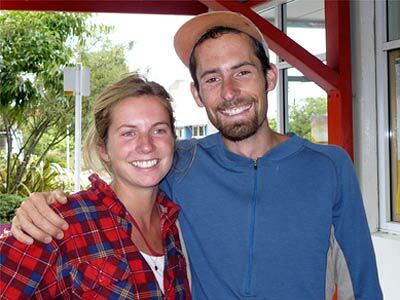 He has been living and working most recently in Utah and Maine; now he is hiking around in new Zealand with a friend, Jane Gallaudet. Eli said he plans to leave on February 4 for Samoa, and from there, he's not sure where he will go next. What an adventurer! 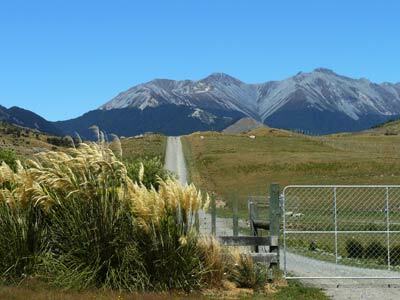 After saying goodby to Eli and Jane, we rode back to Manipouri  surprisingly easy and fast in both directions  and saw our first patches of blue sky for the day. We had dinner in this campground's remarkable kitchen-dining area. On Wednesday we had a leisurely day, locating the wharf from where our boat would leave the next morning, taking a walk, adjusting the bikes and so on. Very excited to be going to Doubtful Sound on Thursday!